When Pope Francis was still known as Jorge Bergoglio, Archbishop of Buenos Aires, he would ride the subway into the most impoverished parts of the city for home visits. If you know only one thing about the guy, that’s likely it—it’s his origin story and, if you’re a true believer, a symbol of his humility and his empathy and his commitment to the poor and his belief that the church shouldn’t stand above the people, but with them. It’s ultimately what makes him “The People’s Pope,” as agreed upon by Time, the New York Times, Rolling Stone, Vanity Fair, The Nation, an overpriced US Weekly commemorative issue, and probably every other periodical lately invading your mailbox, save maybe the LL Bean Fall Hunting catalogue. Francis, as you might have heard, just completed his first (and possibly only) visit to the United States. He met with President Obama on Wednesday, addressed Congress on Thursday, and spoke Sunday as part of the World Meeting of the Families in Philadelphia. “Family”—what that word means, and how it relates to the church—has been one of the Pope’s primary concerns, and America honored this commitment by sending one of our finest dignitaries to introduce his speech: Mark Wahlberg. In between, Francis spent Friday in New York City, addressing the U.N., visiting Our Lady Queen of Angels School in East Harlem, and driving through Central Park en route to mass at Madison Square Garden. Having won two tickets in the city-run lottery, I earned the privilege of standing roadside in the park to watch him drive by—an odd spectacle, but an oddly spiritually fulfilling one. That afternoon, something like 80,000 New Yorkers were so enthralled by the idea of a pope once known for visiting people without pomp or security that they made his arrival a massive event and submitted themselves to airline-style screenings in order to gain entry. A friend who studied Christian theology (before converting to Judaism) planned to join me after work; I arrived around noon, and people were already concerned that they wouldn’t make it through the line by the 3:30 p.m. cutoff. My main interest, however, was bootleg merch: As expected, middle-aged men had set up shop around Columbus Circle. Their T-shirt designs left something to be desired—most had the cheap printing and clumsy phrasing recognizable to anyone who’s walked across the parking lot after an arena-rock show—but it quickly became clear that many folks in the Papal Fan Army had already brought their own: “I <3 Pope Francis,” “I [Pope Francis] New York,” “I [Mitre] Pope Francis,” etc. “I Have My Pope-moji!” will age the fastest, but it will also age the best. Cutting through the crowd, I purchased two “Straight Outta the Vatican” buttons and tried to find the end of line, which meant following the people who had just purchased Vatican flags. Those flags were really popular, which is strange, because most Catholics I’ve known really resent the Vatican. We’re often told that Francis is at odds with the institution, and this is almost always intended as a point in the Cool Pope’s favor. Moreover, Francis himself has tried to reduce the papacy’s prestige and move power away from the Vatican: He wears simple clothes rather than imperial robes, he refused the papal mansion, and he has encouraged a more horizontal relationship between the church and the laity. The irony—very apparent in Central Park—is that these moves have made Catholics more excited about the papacy and the Vatican than they’ve been since early in the John Paul II days. This becomes even clearer if you consider how the opposite happened under the previous pope, Benedict XVI, a man who wore special shoes and elaborate costumes in order to restore some papal mystique, but thereby made the papacy seem almost despicable. Still, it should also be noted (it often isn’t) that Benedict’s papal resignation in 2013— the first voluntary one in the history of the church—made Francis’s transformation possible, both literally (by leaving the papacy up for grabs) and symbolically (by striking a major blow to the notion of an infallible pope). These thoughts carried me through my first half-hour or so in line. Unfortunately, I was still nearly three hours from the gate. My “zone” (there were three) began on 63rd Street, then walked down to 60th and back up to 65th and back down to 59th, where we finally entered. During one lengthy standstill, someone—not even a recruiter—asked me if I were considering joining a religious order. (No.) There were some Franciscans there, though, and their matte robes made them look like Yeezy Season models. My friend was running late—he would become the last person in line — but I entered the park at 3:30. I soon came across maybe the most New York thing I’ve ever witnessed: two strangers arguing about the best route for Francis to take from the school to the park. Second Avenue or FDR Drive? Both sides were passionate, but the general mood was so positive that even this ended happily, the (obviously correct) Second Ave. guy courteously bowing out with the line, “Hey, any route he takes is the right route!” So papal infallibility is still good for something. The next 90 minutes were characterized by long periods of inactivity punctuated by brief moments of excitement. 4:30 p.m. A rainbow appears within a cloud almost directly overhead. No one seems to know—or care—what it might symbolize, but everyone takes photos regardless. 5:08 p.m. Two cops pass on motorcycles, and the crowd erupts. It’s like a rap show where the star arrives deliberately late. 5:15 p.m. The mother-in-law offers a new report: Francis just left the school. 5:23 p.m. Two guys hold a nearly life-sized cardboard Francis above the crowd, either completely oblivious or executing one of the best-conceived trolls I’ve ever seen. Their cut-out blocks the view of everyone behind them, so it immediately elicits jeers; it’s worse when the guys turn it around, but they keep it up, forcing devout Catholics to literally boo the pope. 5:25:44 to 5:25:59 p.m. 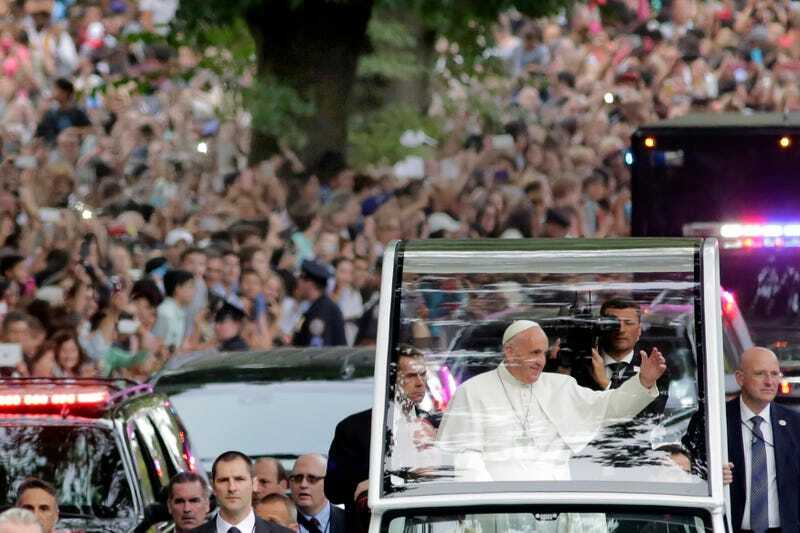 The pope—the real one, presumably—is easy to spot, because he’s wearing white. He’s in a rounded golf cart and trailed by a line of security guards running side-by-side as if about to be photographed for a subway poster advertising the year’s most generic action B-movie. The man besides me mumbles, “Papa … papa … ” while he films—in fact I appear to be the only person who isn’t filming. Francis looks like he’s smiling; I absent-mindedly wonder if he’s ever seen Bruce Willis tear through this very park at the beginning of Die Hard With a Vengeance. And that’s it. Francis passes, and a cloud of dust forms as his fans turn and hurry toward the exits. This might be hard to believe, but it doesn’t even feel like an anti-climax. If anything, it’s almost the opposite: the rare circumstance where a mass of people waited an absurdly long time for something and got exactly what they’d expected. Nick Murray is a writer in NYC. He’s on Twitter. Pope photos by Getty; button photo by the author.